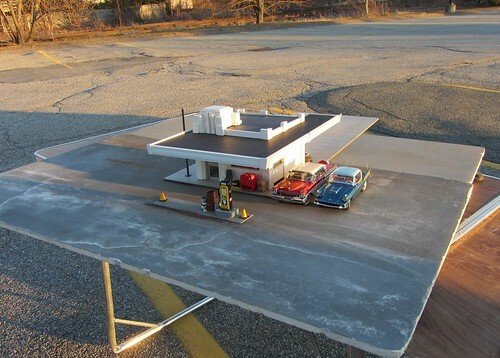 There have been many requests for the diorama setup featuring the Packard Hawk model. You can see how the canopy/roof is just one piece of foamcore with plastic added to the edges. What I have learned over the years, when creating a model, is to capture the essence of the structure. In this case it was the strong horizontal feeling of the canopy. All of the details are kept to a minimum. It really is theater on a small scale.